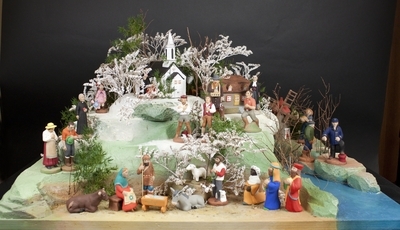 Charlevoix in French-speaking Canada has its own collection of terra cotta figurines depicting a typical Québécois nativity scene. Its colorful characters bring back the memory of traditional activities and historical events of old Charlevoix. Scenes of farming, logging, and shipbuilding alternate with brightly colored houses, towns, and chapels. Our nativity set presents historical personages, villages, animals, folkloric and legendary characters, and of course, a beautiful local rendering of the Nativity group. Terracotta figures depicting the nativity of Jesus, and created by Bernard Boivin in Saint-Joseph-de-la-Rive in Québec. The exact date of creation is unknown. Exhibition label originally written by Fr. Johann G. Roten, S.M. for exhibit entitled "At The Manger" and held at Roesch Library, University of Dayton.